Technology has changed the way we learn, live and work. In addition to the IT resources and support provided by the university, the College of Education, Health and Society has its own IT staff who provide a wide variety of technical support services for the benefit of our students, faculty, and staff. The College of Education, Health and Society's "home" on campus is within McGuffey Hall and Phillips Hall. Extensive use of technology is apparent throughout our College, from state-of-the-art electronic classrooms to the integration of new, up-to-date systems, software and learning tools. Classrooms are equipped with integrated computer and media systems including a projector, Windows computer, VHS/DVD unit, document camera, and Starboard screen. These classroom systems also enable an instructor to use USB jump drives/storage devices and plug their laptop into the system to take advantage of the projector and media system. We continually work to update and enhance our instructional spaces to allow for the highest level of technological integration. McGuffey 322 is an auditorium, classroom, and multiple group meeting area. It is equipped with an integrated computer and media system but also has microphones, loud speakers, a lighting system and a 50” smart board plasma screen. McGuffey 224 is a distance learning classroom equipped with distance connection equipment, microphones, speakers and conference camera to enable real-time interaction between participants on and off campus. The Engaging Technology Lab (ETL) is a state-of-the-art lab used by students and faculty, both independently and collaboratively, to explore how technology can transform teaching and learning. The lab is designed to help students become technology pioneers in their fields and to learn to make games that can make a difference in someone's life. Housed in McGuffey Hall, but available to all professors and students across campus who can request the room through Student Disability Services, the Inclusive Classroom features automatic push-button doors and a touch teaching station that eliminates a traditional standing podium. The Department of Kinesiology and Health has several lab spaces to enhance the student learning experience. All classrooms are managed by our Technology Office. They are responsible for all maintenance and installation issues pertaining to hardware and software. Any software need must be directed to classroom services and requires two weeks notice for testing, licensing and installation. TeachLIVE is a mixed-reality teaching environment that supports teacher practice in pedagogy and content. In the TLE TeachLivE™ Lab, pre-service and in-service teachers walk into a simulated middle-school classroom where the room is real but the students are digital avatars. 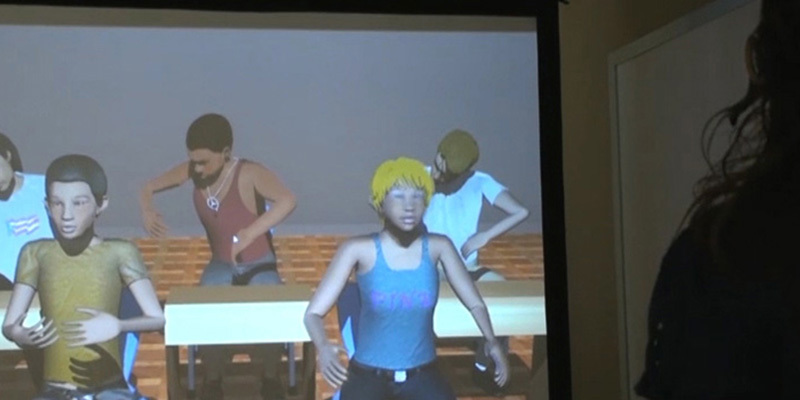 The virtual students controlled by real trainers are made to act like typical (or atypical) pre-teens, depending on the objectives of the experience. Each student’s personality is based upon those typically encountered in a middle school classroom. In the traditional teaching environment we make use of real students to help novice teachers become better educators. In a virtual teaching environment novice teachers can make mistakes without impacting real students, and they can repeat the experience until they become effective educators. For teacher candidates who have what it takes but also have plenty to learn about teaching in practice, the TLE TeachLivE™ affords them the perfect environment in which to make mistakes and improve. Faculty: YOUR students can benefit from the TLE TeachLivE experience. We also welcome K-12 educators who wish to advance their professional development. We'll have more info online for you soon regarding availability and costs, but for now please contact streitm@MiamiOH.edu with the subject line "TeachLivE." The Anatomage table offers a unique, life-size virtual dissection table with an unprecedented realistic visualization of 3D anatomy and interactivity. Clinical Professor Dean Smith notes that at this time, EHS has the only Anatomage table in Ohio. “This instrument provides a learning tool rarely available to undergrads outside of medical schools,” notes Smith. METIman is a patient simulator that can be programmed to display a variety of health conditions ranging from allergic reactions, pneumonia, heart conditions and various symptoms of trauma. Students can monitor Meti-Man’s pulse, heartbeat, respirations, pupil dilation and other physiological factors. While METIman is a powerful learning tool for athletic training students, other majors can also benefit from working with the life-like technology. One of the unique features of Meti-Man is that the "patient’s" symptoms can accelerate if a student is not using the correct treatment. The plan is to videotape these student-patient sessions so that students may review what they might have done differently to gain more positive results. This kind of experimentation is invaluable as students prepare for real-world scenarios. The EHS digital backpack project provides student teachers with access to high-tech equipment such as Smartboards ™, videocameras, etc., to use in classrooms where this technology is not available. The project, introduced in the 2009-10 academic year, has been used successfully in schools throughout Ohio as well as by students doing their student teaching internationally.